Nobo Restaurant | Who Knew Rice Wine Could Be So Complicated? Who Knew Rice Wine Could Be So Complicated? To be honest, the majority of the public is still novice to the world of sake even though it has been around since 710–794 AD. The most common misperception is that sake is only drunk hot instead of cold. There are those who just don’t drink it because they believe it’s an acquired taste, but we’ve learned that most are afraid to try sake simply because they have never been educated on the contents and makeup of the wine. So welcome to the world of sake! More often than not, the sake that has been served warm to you in the past is most likely what veterans like to call Table Sake or in Japanese terminology, “Futsu”. They are made from regular table rice and often times brewed through automated processes, mass produced, and using lots of distilled alcohol to yield greater volume of sake for manufacturers. Futsu, at 75%, represents the majority of all sake on the market. 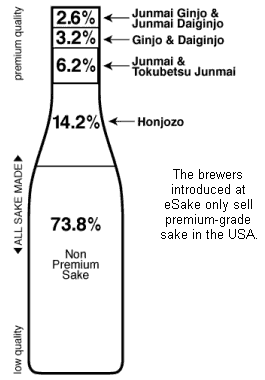 The remaining 25%, albeit the minority, is by far a much more complex and rich genre of sake. The remaining market is made up mainly of three distinct categories: Jumai, Junmai Ginjo, and Junmai Daiginjo, with the level of quality, fragrance, and complexity increasing respectively. All of these contain hand selected rice from their own prefecture, which can greatly differentiate the sake profile in fragrance and flavor. Between the three categories of sake, there is also a difference in how much the rice grains are milled. Starting with Junmai, rice grains are milled up to 70% of its original size, with 60% for the Junmai Ginjo and 50% for Junmai Daiginjo. The central location of the starch component in each grain alleviates the breakdown during the brewing process, thus generating purer and higher quality sake. And it doesn’t stop there. There are more categories of sake such as Honjozo, Ginjo and Daiginjo which are important to know about. These categories also overlap with the prior three categories of Junmai, Junmai Ginjo, and Junmai Daiginjo in terms of milling rate respectively. But the difference lies in the fact that a small amount of distilled alcohol is added at the end of the fermentation process for these three categories to lighten the flavors, often creating drier sake. What we have covered is simply the foundation of sake 101. 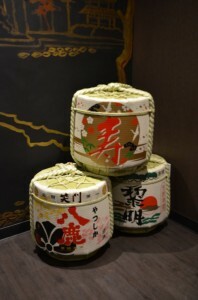 There is a plethora of other types of sake such as Tokubetsu, Nigori and Genshu. We at Nobo Restaurant are proud to able to present our extensive line of Premium Sake. And just because it’s sake doesn’t necessarily mean that you can only pair it with your sushi meal. Sake also pairs exceptionally well with our cooked signatures. As a modern Japanese Restaurant and Lounge, Nobo prides ourselves in offering as extensive of a drink menu as we do with our dishes. Besides being known for our premium sake list, we offer a full line of cocktails and beer to select from. In case you didn’t know, our friendly head bartender is a renowned mixologist who makes a mean mai tai. So whether you’re feeling sake or a martini for the night, we strive to satisfy your thirst.